Fiocchi Munizioni has been in business for so long that their founder actually served under Napoleon during one of the general’s campaigns in Italy. 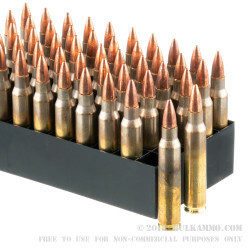 They’ve accordingly had ample time to perfect their manufacturing process, and most of the ammunition they sell in America is made right in Ozark, Missouri. 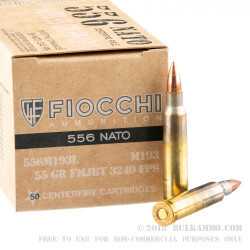 Shooting Dynamics is Fiocchi’s more affordable line of ammunition, although it sacrifices no quality by way of achieving its satisfying price tag. 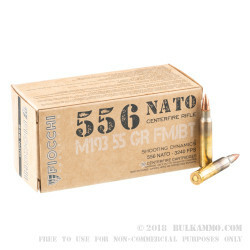 This 5.56x45 cartridge features a 55 grain projectile, which has a streamlined tapered base in order to flatten its trajectory and let it resist the effects of crosswinds. 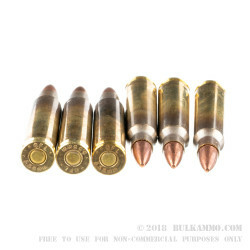 The bullet’s full gilded metal jacket assures that it won’t spoil your accuracy as the result of lead fouling. This round’s new production brass casing is resistant corrosion and wholly reloadable. Its Boxer primer will also not corrode, and serves to protect your action from accumulating caustic residues.